As of Sept, 2018, we have more than 549 beneficiaries at 37 centers! 42 women have so far been released from the project after attaining to at least five goats, and over 40 more are soon to be released. 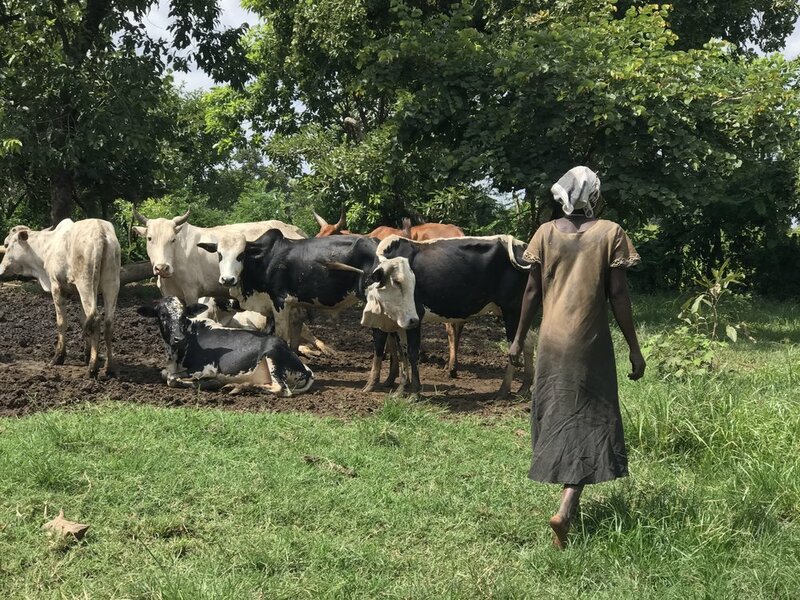 The Goat Project Uganda, as a grassroots economic empowerment scheme, has proven to be very viable, and at a much smaller cost of operation compared to other projects of the same mindset. The project is receiving very uplifting results from the beneficiaries and has even garnered attention from government officials for its simple yet effective results. This house is being built for the family of a beneficiary. She is using proceeds from her goat herd to fund construction stages. She has purchased tin for the roof, and is saving now for the wooden beams. Additional livestock: It is a dream of most women to own a cow. A cow will provide milk for her family, and its offspring fetch the equivalent of a year's wages. This women sold a few of her goats to buy a cow. (The community keeps its cows together for safety.) The cow is now pregnant and she still has 5 goats. She plans to keep several goats always, in order to fund her children's education. The gift of a single goat has enabled her to dramatically change the future for her family.